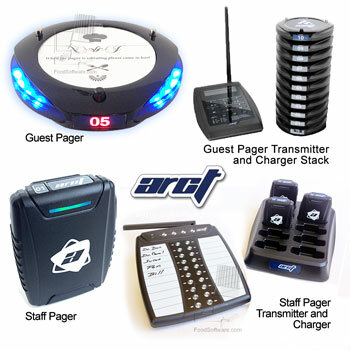 Restaurant guest pager system by ARCT for customer or patient paging too. Plug-and-play kit is complete with transmitter, 50 pagers and charger system. 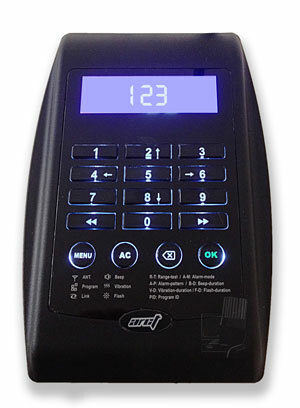 Pagers alert guests or clients with silent pagers that vibrate, flash or beep. No monthly fees. Tough restaurant pagers are built to withstand abuse. Often used in hospitals, clinics, retail and auto sales. Factory warranty from ARCT pagers systems. New for 2015 with the latest advances in power efficiency, range and features! 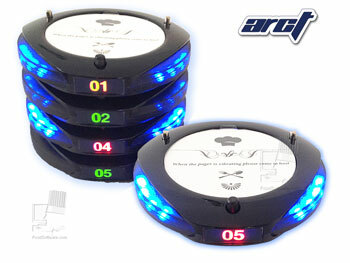 This restaurant guest pager system by ARCT is for retail customer and patient paging too. This plug-and-play kit is complete with the transmitter, pagers and charger system. 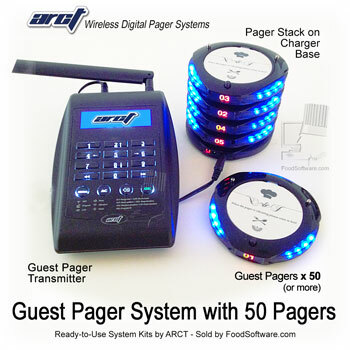 Pagers alert guests or clients with pagers that vibrate, flash or beep. There are no monthly fees and no need for outside services. These pagers are built tough to withstand restaurant abuse but they are often used in hospitals, clinics, retail and auto sales. A one-year factory warranty is included. With guest paging, customers or patients feel more confident that they will be not be forgotten so the experience is more pleasant and manageable for both staff and guests. Manage crowds easier and quicker. Quiet the noise from overhead public address systems and make them completely unnecessary. Enhance the atmosphere of your waiting area with reduced noise. Reduce wait time and turn more tables to increase sales. When guests arrive, they are greeted by a host and given a pager. The host writes the pager number and seating preferences on paper. Guests are free to roam within the pager range (the pagers have an out-of-range alert). If guest go out of range, pagers beep until they get back in range. When tables are ready, the host enters the pager ID into the transmitter keypad and the pager flashes and vibrates. (Various alert styles are selected with the transmitter.) Guests notice the coaster and return to the host, who then shows them to their table. 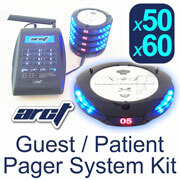 Guest pagers are great for use in hospitals and medical offices and are widely used for such. Pagers help assure patient privacy because patient names do not have to be called out in public as their turns come up. It makes waiting more comfortable by allowing patients to wander or wait in the cafeteria with a cup of coffee. Automobile service is another great application for guest pagers, as they allow customers to wander nearby, up to one-half mile away, until their cars are ready. ARCT transmitters have the range and power to be effective in large office buildings. Transmitter repeaters are available for situations that require extra coverage by radio. With an internet connection and message unit services, you can reach any cell phone anywhere by voice or text. This system kit includes 40 guest pagers, an ideal number for restaurants with maximum wait times of one hour with up to forty parties waiting. Additional individual pagers may be purchased separately and we also offer larger systems (see the next section). Click on the links in the margin to the left to go to listings for guest and staff pager systems of other sizes. You can see their prices and add them to your shopping cart from their respective pages. Call us at 805-375-7000 for quotes on unlisted systems. Liberal use of alert and status lights such as a flashing "active" light that shows pagers are working, charging, waking up, etc. Pager chargers (1 base required for every 15 coaster pagers). Staff pager starter kits. See the left margin of this page for links to the variety of staff pager system kits. When you click the Add to Cart button, you will see options to increase the quantity of pagers or add a staff pager system to your order too. ARCT brand pager equipment is not compatible or related to LRS or Long Range Systems brand pager systems. ARCT, LRS, Long Range Systems and Windows are trademarks and brand names of their respective owners. This page includes copyrighted text and images belonging to Advanced Analytical Inc. which must not be used without their owner's permission.